In the mix are also some new face makeup products — the new Marc Jacobs Coconut Face Primer, along with foundation and concealer from a new line called Stellar. They’re the line with all of foundation colors for girls in the middle of the shade spectrum. I’m wearing Stellar Limitless Foundation in S05, which is a light medium with yellow undertones, and Limitless Concealer in S03 (light/medium and yellow) on my under-eye area. As far as shade matches go, I’m impressed so far. Most of the time to get foundations and concealers to work for me, I need ones with more yellow in them, and I still have to tweak them a little, but these are spot-on. I still have to test them for wear time over the next few days, so I’ll get back to ya. I love Bronze- brown tones with a pop of colour! I normally do blue, but this purple is amazing Karen! Purple liner is always a great thing, Eleni! Try it sometime. It would work well with your coloring. For me tomorrow… it’s a job interview day. Dunno how things will go…fingers crossed. But I went stash hunting myself to figure out what to wear on my face! Wanted *some* color, but probably not too much – so even if I have some purple (love me some purple sometimes), decided I’d *probably* go for the red collection from Chanel. I’m thinking… the Chanel Candeur et Experience eyeshadow palette, but with a fairly light hand, with Le Volume in black on the lashes, and hmm… maybe Noir Petrole or Noir Intense to line the eyes. Then some Plisse Lumiere from Chanel to highlight, and Rouge Profond as blush (this is the one Malice has to fight against for the title of fav blush… 😉 ). Your look for tomorrow sounds lovely. I think the look will depend on the industry. If you’re applying for a job in the beauty industry, or for something in the creative field, red would be great. But if it’s something on the more conservative side (banking, finance, law), then I’d go with the muted lip. I tend to err on the side of not-too-flashy when it comes to interview makeup though. I guess I’m old school like that! Is the position one you’re hoping to get? It’s a data science job – and I would *love* to get it… They seem like people it would be great to work with, and I think I’d learn a lot working there. LOL, yeah, a little extra spending money for makeup never hurts. Good luck! I’m sure you’re going to do great! Amazing timing! Just back and sat down at my desk looking on FB and your blog…when an email arrives that you replied. So… I think it went super well. Basically as well as it could have. You never know…someone else might have been even better then me, ofc. So we’ll see if I actually got it. Sadly didn't stop there. 😛 Went to Tom Ford and got a blush from him too…since it seemed to be a blush day. Got Gratuitous – a kind of plum color. Love it so much. It's not a very common shade I think, among all the more ordinary peaches and pinks you see in blushes. Damn. Better get that job…! 🙂 Hope you're having a lovely day too, Karen! I will keep my fingers crossed for you. Work is always better when you have people who you get along with around you, and it sounded like your co-workers could be a good group. It’s important. Ahhh, blush haul! I remember Rose Glacier. It’s on the warmer side, yes? Should be good for the summer months! Do you live near an Hourglass counter? Not that I need to be your blush pusher or anything, but if you like plums, they have this beautiful plum blush called Mood Exposure. It’s one of my faves. This liner is so beautiful on you! 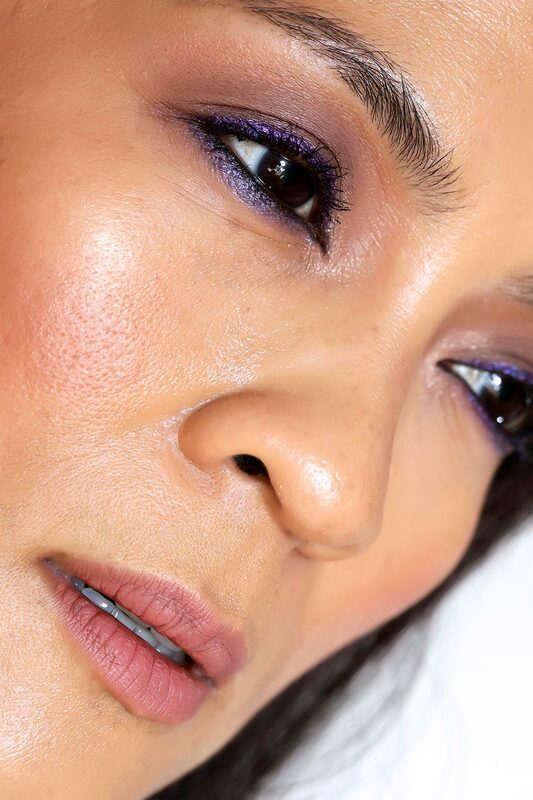 When I do bright colors (or even dark colors), I usually keep it to just liner because I don’t like the look of myself with dark or bright color on my lids – it’s unflattering. I haven’t! I’ll have to check it out! My eyes can be pretty sensitive. Hmm… You might want to skip it then as the glitter might be problematic. Off topic but I was browsing Sephora last night and they have a waterproof twist up liner in their Sephora Collection line that’s supposed to be good for sensitive eyes and those who wear contacts. I’m gonna swatch a few today. I have to go in because I’ve been using this Klorane shampoo and conditioner combo and my hair hates it. 🙁 So now I need a clarifying shampoo. Very pretty eye look! Never thought to combine bronzey shades with purple. When I do color I tend to veer toward the violet, lilac, mauve shades. I have at least a half dozen purple to plum eyeliners. They’re the one thing that makes my eyes look even greener than they are. Thank you, Tatiana. 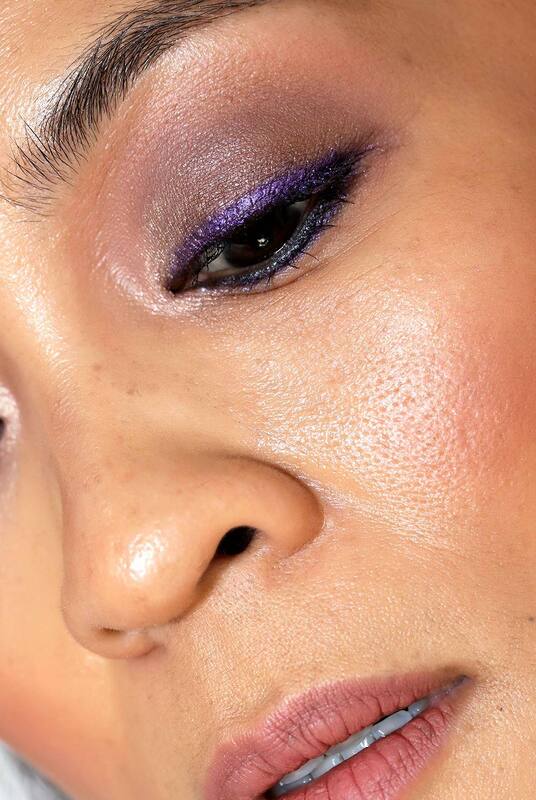 Do you have a favorite purple liner? I’m going to Sephora today to check out some more. I want one without glitter. Of course you can’t forget Urban Decay 24/7 pencil liners in Rockstar and Empire. Okay, so maybe my purple liner collection is actually closer to a dozen. Ha, I think I’ll have to reply down here actually. Looks like after a set number of replies which get progressively more indented, the ‘Reply’ button then vanishes for me. As for Hourglass – oops. Actually walked past the counter as I was heading to take a look at some Lipstick Queen stuff. Completely ignored it! But just googled Mood Exposure… looks great! Might be able to take a look in about 1h. Was invited to a Chanel ‘makeup masterclass’, as they called it. So off to put on some plums and the Tom Ford blusher, before I go out again. Woohoo! Hey Karen, I love Purple and I really like the fact that you utilize it so often- looks so good on you. But my skin is not as tan as you, probably two shades lighter- so when I try purple eyeliner on my lids, I look scary. Any purple shade suggestions? I’ve never had a brown phase! Black and Taupe though for sure. And Stila Kitten. My latest pot of Kitten is subpar though. I’ve been waiting for you to do Designer Purple! How gorgeous on you!! I love playing with coloured liner. It’s such an easy way to spice up a look 🙂 . And it looks like I have to keep an eye on the MAC eyeliners, ’cause that purple looks amazeballs. Daewyn recently posted … Unboxing the April Goodiebox: The Retro Box!